Sigh. My grape jam is, in all actuality, more of a paste. I tried to stir some into my yogurt the next morning but alas, it never came off the spoon. I’ll have to use this batch on a cheese plate instead, much as you would a quince paste. Kindergarten paste texture aside, the color is gorgeous and the taste is fantastic — unlike any store-bought grape jam I’ve ever had. It’s bright, fresh and simply tastes of juicy, ripe concord grapes. Back into the kitchen I go. 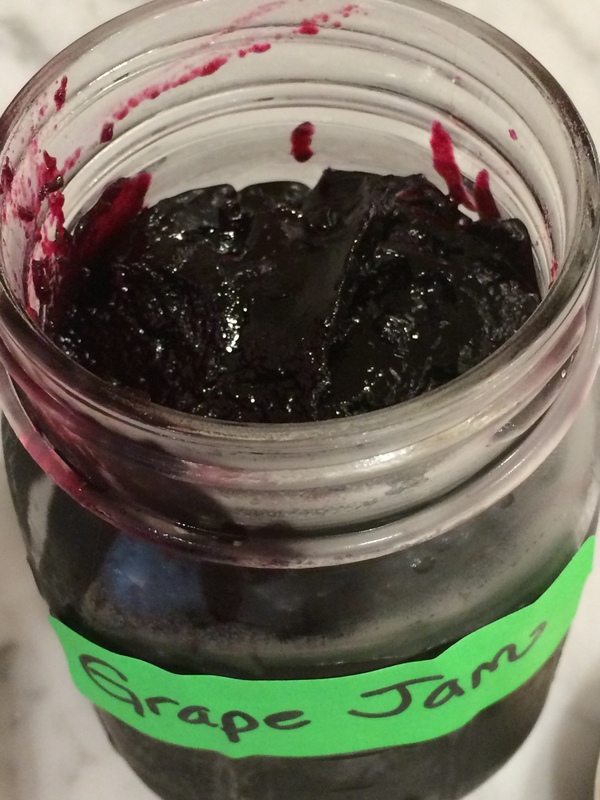 Concord Grape Jam Recipe: I did skip the step that requires peeling all the grapes. I tossed them in whole and pulverized them with an immersion blender instead. This worked very well to breakdown the skins, but it did rain sugary grape juice all over my kitchen. BIG MESS. I’ll be peeling all the grapes next time. This entry was posted in Sauces & Condiments. Bookmark the permalink.